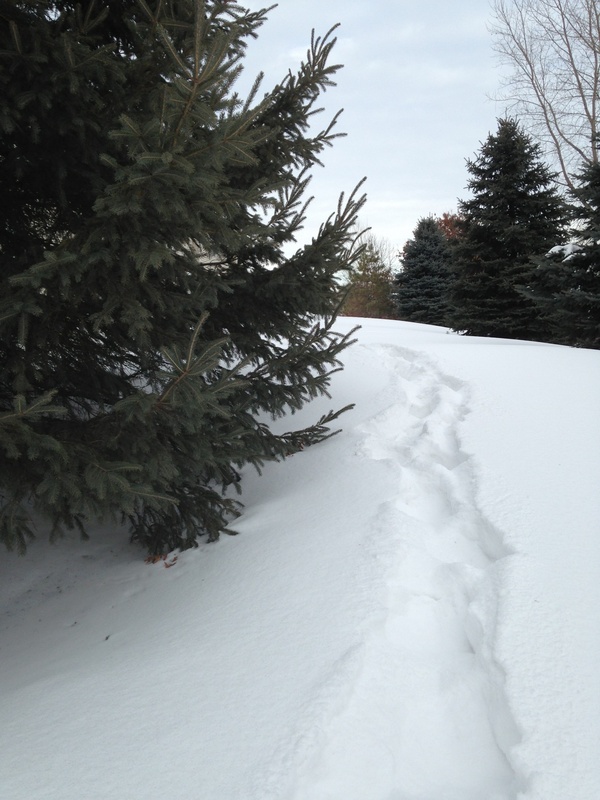 This entry was posted on February 20, 2014 by Patrons of the Pit. It was filed under Uncategorized and was tagged with bbq, beef ribs, cooking, food, foodie, grilling, patrons of the pit, poetry, weber smokey mountain, writing. You guys have style! It looks awesome! Thank you sir. Likewise back unto you! I like your work. Keep ‘um coming! Please follow my blogs, as well. My Twitter account is @ronfeir Thanks! Though a little hard to tell, those look like the ribs pealed off the rib steak. 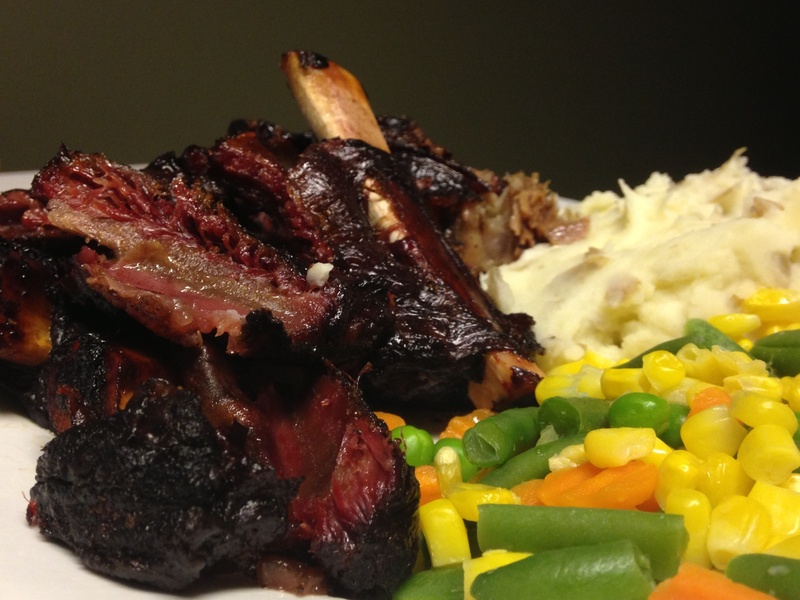 Though not as meaty as the standard beef short ribs, they are far more tender. Anyway, I love beef ribs, and those look almost sinful. Thanks Rick, they were beyond sinful I think! They were also very cheap I know, which surprised me for ribs. I’d trust your judgement much further than my own as to what portion of the cow they came off of. All I know is that tasted amazing, and I’d gladly do them again. I love beef ribs too! Yum! Gotta love a beef rib. The wife and I had Valentine’s dinner at Lawry’s in Dallas last weekend. Lawry’s has been a special place for her from her teenage years in Orange County where the Five Crowns was where they had family celebrations. After the “carving master” sliced our selections, he cut off a bone and set it to the side. Me, being me, I was quick to inquire, “What are you going to do with that bone?” It went on to my plate and it was a meaty treat. Mama made it clear that there would be no picking it up and going at it like a T-Rex, which I could live with, but we did learn later while joking around with the waiter that the grip it and rip it tactic is often used in that elegant place. Beef ribs – gotta love ’em. Haha, enjoyable story Joel! I use that technique myself, no matter how classy the establishment. There is just something about meat on the bone, and gnawing on it like a pit bull, that simply sets a man straight in his ways again. Bless ya for requesting the bone. 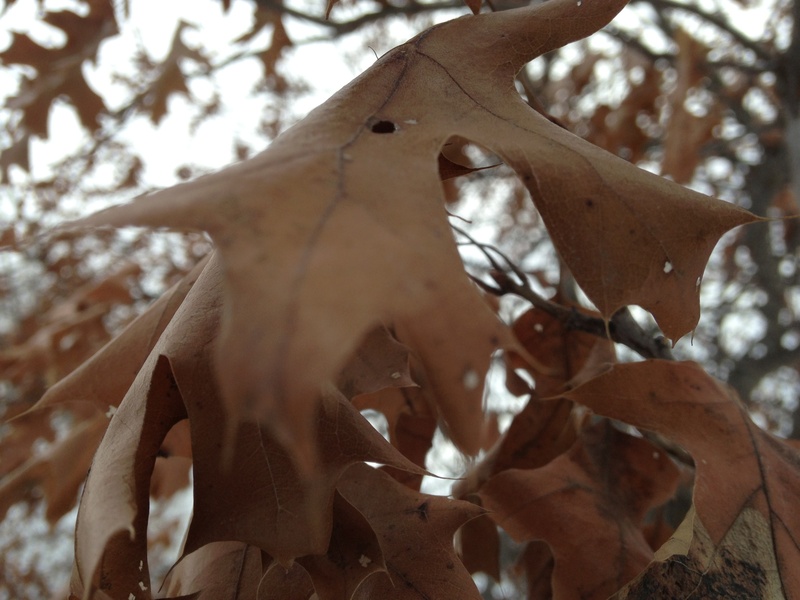 We are off the same tree that way, you and I. Have a great day, Joel. Thanks for the story! Once again, I wish WordPress would come up with a, “love” button. “Like” simply does not adequately convey my feelings toward beef ribs slow cooked on a backyard grill and your colorful narrative detailing the event. Gotta love it! Consider your love then acknowledged, John in Ecuador. It is our high privilege to bring you the account vicariously through the cold folds of cyberspace, and unto your computer screen there in the paradise. Drool on the keyboard is your own problem tho. Take care, and bless you both! This reads like a love letter to a rack of ribs… I’m swooning! Wonderful stuff. Haha, shucks! That was funny! But true…Thanks much! Did my first beef ribs during the super bowl, turned out gr8. Ah very cool. A worthy super bowl food! Hey my Smokie Brutha … another job well done! 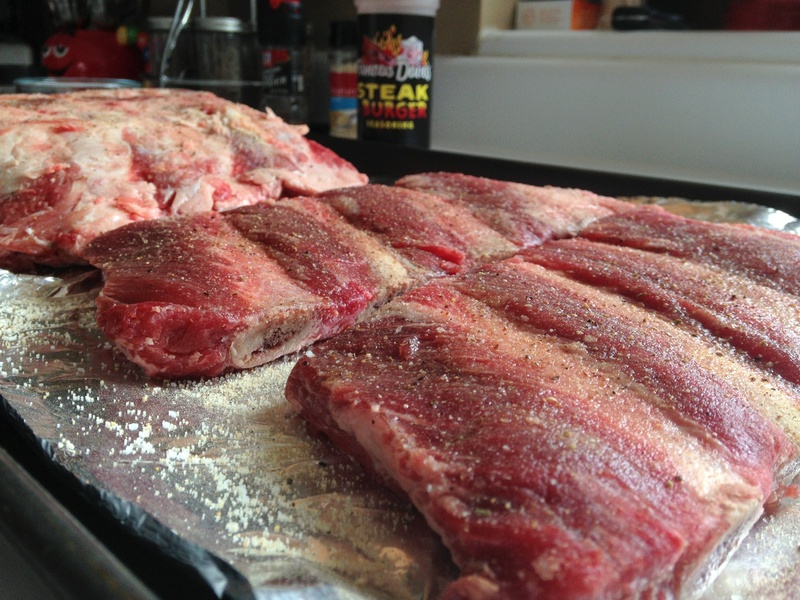 As to ‘where’ they come from … yours are the bones taken off the Rib (as in Prime) section (a full rack has 7 total). The typical Short Rib section has more meat on TOP of the bones and come from the Blade section of the carcass (there should be no more than 4 of them in a rack). I’m going to write something about these bad boys myself one of these days. Again … good job my friend … stay hungry. Ah thanks Dougie! Always a treat when the resident butcher chimes in. Thank you kindly! As always a meaty read and a delicious recipe. I will have to admit I have never grilled beef ribs, pork yes, all manner of beef but never the ribs. This sounds to good, that plate with the garlic potoato mash and veggie medley is making me so hungry. Oh you need to try it then. It’s no more challenging than pork ribs really, and a most notable difference in taste. A good beef flavor for sure. Good eating. Beef ribs are fast becoming my favourite rib due to them being half the price but twice the meat of pork ribs! Our feelings are mutual! Beef ribs are just plain awesome. Thanks for chiming in to our beef rib banter! Liz, that is half the reason I fancy the long smokes as I do! I am a student of leisure! I never slow smoked anything, gotta give this a try. Ah yes, I’ve heard of more than one vegetarian falling off the wagon when they entered a good BBQ joint. Its hard to blame them. I know it, good ones are real hard to find it seems. At least up here. I would have thought Texas would have been the place to be for mass selections of beef ribs. Aw well. Thanks for stopping by. Always a pleasure! The reason you rarely find Beef ribs with a lot of meat on them is because the butcher can get MUCH more for the Rib Eye (which is where they come from) than the bones. 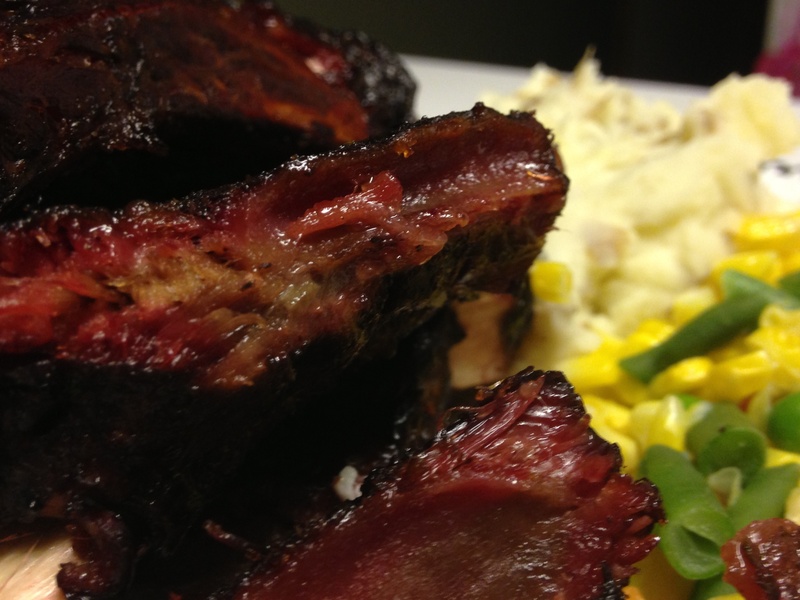 Try the Short Ribs instead … they come from the chuck and are MUCH meatier. 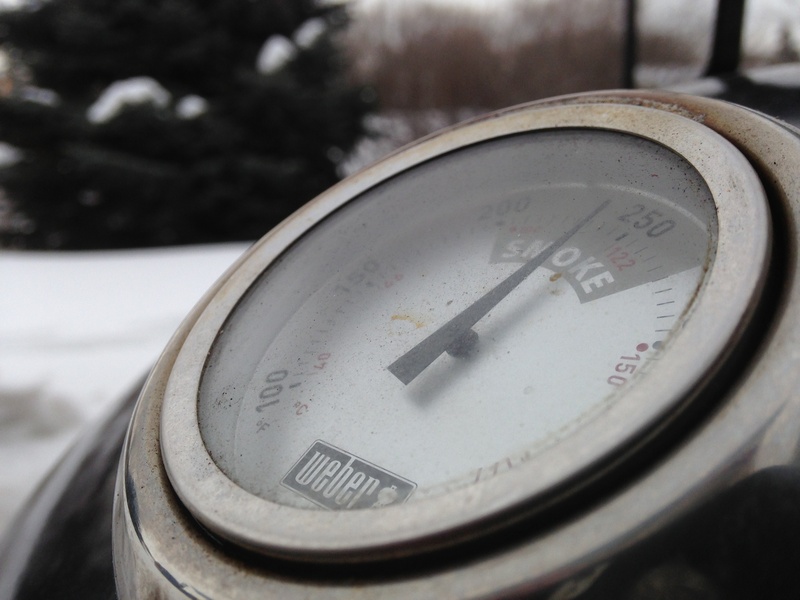 Roast or smoke them, low and slow …. you won’t be disappointed. Sounds good. Looking forwards to it! I’m coming over. Oh wait, I live in Texas. Aw well, you’ll surely find better than this in Texas anyways. That is the kingdom of beef! I would brave the cold for ribs like this. You and me too! Thanks Kim! One of our favorite bbq joints, and it’s only a few years old, is called Q Fanatics. It’s in the northern suburb town of Champlin, and they do a right fine rack of ribs. Better than fine. They even made it to the show diners, drives and dives, or what ever its called. It’s worth a stop if you’re in that area. Well done.. I’ve been stuck on pork but need to try beef ribs again.